Shaken beef is that Vietnamese/Chinese/French classic dish. I used to eat this a TON living near Westminister, CA. This dish is the perfect meal when paired with a good red fried rice, or just a plain warm bowl of steamed jasmine rice. The trick to a good shaken beef is of course, butter. So to Veganize this dish seemed almost better to pursue then what I remembered it to be, because you could use really great tasting Vegan butter like Earth Balance or Miyoko’s and the dish would be super delicious. Of course, you might be wondering, well what about the beef? Well, the beef is really just an easy venture. You can use plenty of soy based products (Soy curls, tofu..etc. ), or in my version here, I used Gardein’s Beefless Tips. I love using Gardein products because they make it super easy to prep and cook. The beefless tips are very thick and shockingly tender. When marinated with light soy sauce base, they can really shine. You don’t need a ton of additional soy or sugars because they already have salts and sugars in them. 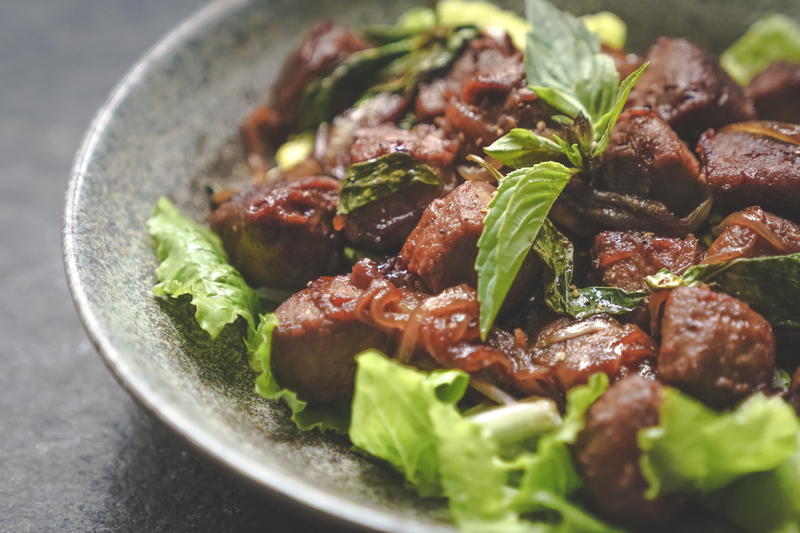 Fry them up in a hot pan with some onions and basil and BAM, it’s like taking me back to the days of eating meat…only better and without the taste of cruelty 🙂 Here’s my version of Shaken Beef that you can do in 30 minutes or less! Prepare all aromatics. Slice yellow onion, peel a slice of ginger, and mince 1 clove garlic. Pluck 1/2 cup of Thai basil leaves, set aside for stir fry. Marinate Gardein Beefless Tips with rice wine, Tamari, garlic, and Golden Mountain Seasoning. Add fresh cracked pepper and let stand for 15 minutes. In non stick pan, heat over medium high heat. Add 1 tbsp oil, ginger, sliced onions. Caramelize onions until golden brown. Once brown, add in marinate beefless tips. Sear for 3 minutes on one side, toss, and sear for another 3 minutes. Add in fresh basil, and give another toss, cooking for final 2 minutes. To plate, prepare chopped romaine lettuce and thinly sliced red onions. Place shaken beef over lettuce and squeeze fresh lime juice to serve.